Stephen Hawking, the British physicist who’s best known for his pioneering work in explaining black holes and relativity, died today at the age of 76 at his home in Cambridge. 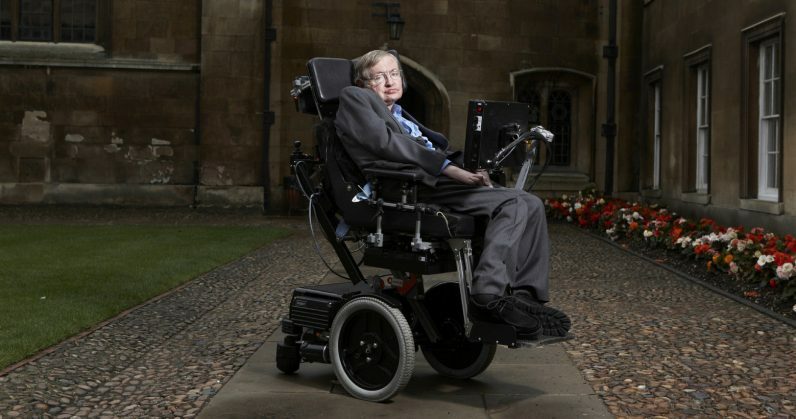 Hawking had been wheelchair-bound since the 60s after being afflicted by a motor neuron disease at the age of 21; he subsequently lost his voice to a tracheotomy. But neither of those tragedies stopped him from continuing his groundbreaking work, being elected Lucasian Professor of Mathematics at the University of Cambridge, and publishing the best-selling explainer about the origins and fate of the universe, A Brief History of Time. As his condition deteriorated, Hawking was relegated to communicating only by typing, using a sensor activated by a muscle in his cheek. In 2014, Intel and SwiftKey built a language model to help reduce the time and effort required for Hawking to type. Hawking also featured prominently in pop culture: he appeared in TV shows like The Simpsons, Futurama, and The Big Bang Theory, and was also portrayed in the 2014 Oscar-winning film, The Theory of Everything. The BBC has a great piece from 2016 on some of Hawking’s most important work, and The Guardian has a brilliant set of photos chronicling his life. Plus, CuriosityStream, a video service that offers a wide range of documentaries, is airing Stephen Hawking’s Favorite Places, a three episode docu-series that follows Prof. Hawking on a journey through space and time as he unravels some of the biggest mysteries of the universe. You can watch the series for free until Friday (March 23) here.